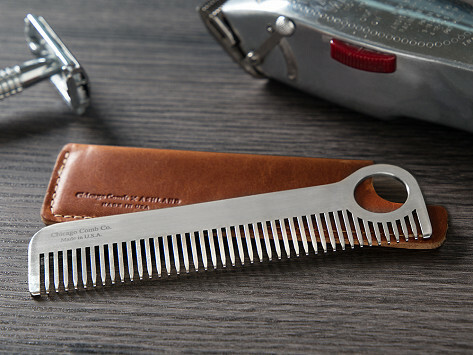 Keep every hair in place with this all-American comb. Each is laser-cut and hand-finished from Kentucky steel and Ohio titanium and Made for a Lifetime. Have it engraved with a custom monogram for a personal touch and pass it down for generations. Keep your comb protected in the vegetable-tanned sheath that will age beautifully. It’s crafted in a family-owned Chicago tannery from full-grain leather and hand-oiled for a luxe finish. Dimensions: Comb: 5.5" x 1.5" x 0.1"; Sheath: 5.7" x 1.3" x 0.2"
This sheath was the perfect accompaniment to the comb. I bought it in black for my son-in-law, and he loves it! 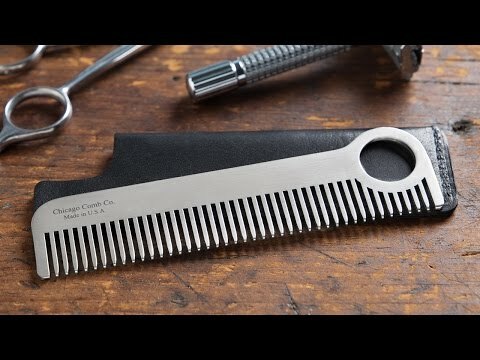 This comb is very well made and the hole in one end seems like a good idea. However, I have arthritis in my fingers and found the comb too small to use comfortably. It didn't matter how I used the hole, when I combed my hair, my hand was in the way and I couldn't see what I was doing.